The Silverbug community has taken the precious metals world by storm over the last couple years. The Silverbugs have released a number of different themed silver rounds, including the latest series: Welcome to Silverbug Island. Now, the 2016 1 oz Silverbug Proof-like Mermaid Silver Rounds are available at Silver.com. Third round in the Welcome to Silverbug Island series. Mintage limited to only 20,000 rounds. Consists of one troy ounce of .999 pure silver in Proof-like condition. Edge of the coin features a serial number. Obverse features a mermaid design. The Welcome to Silverbug Island series will eventually feature eight different rounds. All of these rounds will be minted by North American Mint based on designs from members of the Silverbug community. Each design will also be created in a variety of different finishes, including antique. This series is inspired by the search for gold and silver. Most of these rounds are pirate-themed and feature ships sailing on the open sea. Previous releases include the Finding Silverbug Island and Kraken rounds. 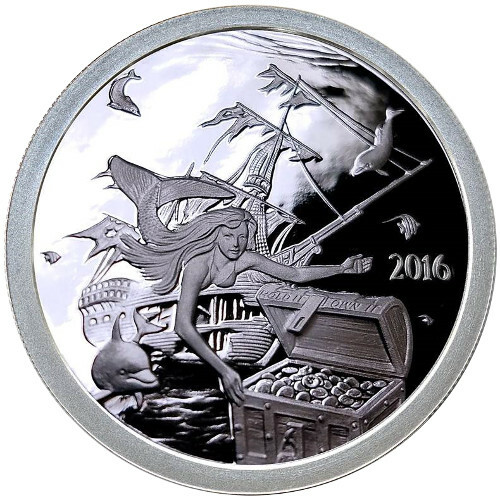 The reverse of the 2016 1 oz Silverbug Proof-like Mermaid Silver Rounds features the same design as the rest of the rounds in the Welcome to Silverbug Island series. A ship can be seen sailing across the sea surrounded by land masses made of gold and silver coins. In the background, a second ship can be seen sinking under the sea. 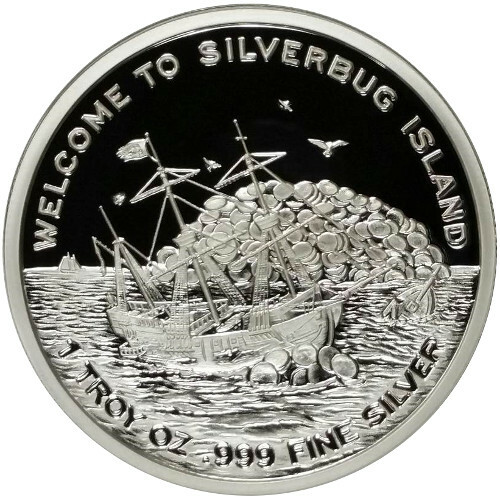 The top edge of the round reads, “Welcome to Silverbug Island,” while the bottom edge details the specifications of the round. Each of the 2016 1 oz Silverbug Proof-like Mermaid Silver Rounds has a proof-like finish, which gives each coin an ultra-shiny appearance. This shiny appearance makes them look like proof specimen coins. All of these rounds also feature a serial number along the edge.